Be sure to grow enough of these to snip a few for your spring bouquets! Pretty flowers, stunning silvery foliage and seed heads that look great. 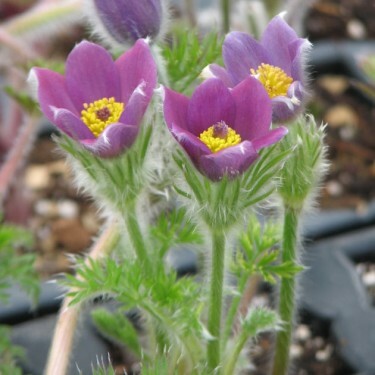 Pulsatillis vulgaris, or Pasque Flower as it is commonly known, is a low-growing, clump-forming, early spring-flowering perennial. Pasque flowers are the early harbingers of Spring, appearing before the leaves has fully emerged. The foliage is quite attractive: soft green, ferny and deeply divided. They are excellent in rock gardens but do requires good drainage.